It’s always hard to know what to call a musician who plays more than one instrument. “Multi-instrumentalist” seems to be the most popular, but it also, to me anyway, seems a bit pretentious. So I’ll just say that Jason Bodlovich plays the drums and the guitar. I’ve not heard his guitar work, but judging from today’s JFASN album, his drumming is outstanding. That album is the 2002 Moonrise release, “Blues For Dexter”. As you probably already guessed, this is a tribute to the greatest tenor saxophone player ever to live, Dexter Gordon. “Blues For Dexter” consists of nine tracks, four of which were written by Gordon himself. The title track, appropriately, was written by Bodlovich. The set opens with “The Panther”, one of Gordon’s popular compositions. The arrangement used here opens with Bodlovich’s drums, followed shortly by the horns and Ray Brown on bass. The group acquits themselves well with this one. Next is “Cheesecake”, another popular Gordon composition with an immediately recognizable opening. The gang really moves with this one, a tune that makes it impossible to sit still. Bodlovich on the drums, Brown on bass and Thomas on trumpet really shine for the first half, then Fuller takes over with the piano until that great tenor sax sound jumps in. By contrast, the Gershwin’s “I Was Doing All Right” sounds positively sedate. It’s still a wonderful song, and I’m tempted to drag out the old “burns with a quiet intensity” line. The Gershwin’s knew how to throw notes together in a brilliant combination, and this is a great example. Thomas’s muted trumpet is especially good. 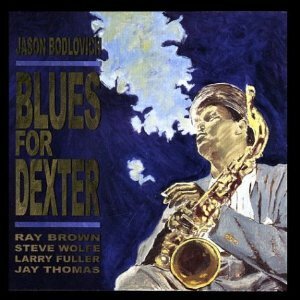 “Blues For Dexter”, the only Bodlovich original on the album, features Bodlovich himself and bassist Brown doing their thing together. At just over three minutes, this is the shortest song on the disk, and that may not be a bad thing. Not to be critical of the song. It just seems a bit odd to me to write an homage to a tenor sax player and then not include a tenor sax in the performance. My yard sale copy of the album is missing the liner notes, so perhaps that’s where the explanation lies. Regardless, the arrangement allows the great Ray Brown plenty of opportunity to shine. “Catalonian Nights” is next. This is one Gordon composition that I’m not sure I had listened to, really listened to, before I first played this album. It’s an interesting piece, sort of a mid-tempo with lots of that great tenor sax sound. “The Duel”, appropriately enough, features Thomas and Wolfe going at it in the traditional tenor sax duel. The wonderful thing about these duels is of course the fact that each horn player, striving to outdo the other, always manages to at least outdo himself. These guys are no Gordon, Griffin, Ammons or Stitt, but they still do a bang-up job. “Guess I’ll Hang My Tears Out To Dry” is a nice change of pace, a beautifully plaintive ballad that brings to mind late nights and smoke-filled clubs. “Tanya” is the penultimate song on “Blues For Dexter”. During eight and a half years as a jazz DJ, I listened a lot of jazz music, and I have to say that “Tanya” has one of the more recognizable beginnings I ever heard. This song always keeps you attention, despite (or maybe because of) it’s slow tempo and odd timing. As presented here, “Tanya” runs just under eleven minutes. Listening to this is like going on a journey to a familiar place via a new route. You know you’re going to wind up someplace special, but you don’t know how you’re going to get there. I don’t know which if the sax guys carries the bulk of the tenor work here. I suspect it was Wolfe, but whichever it was, he did a superb job. Absolutely superb. “Blues For Dexter” closes with the greatest sax duel song ever written, the Gene Ammons/Sonny Stitt classic, “Blues Up And Down”. You know the routine so I’m not going to waste my time describing it, other than to say everyone has a turn in the spotlight and no one disappoints. “Blues Up And Down” provides a magnificent ending to an album full of magnificence. “Blues For Dexter” is a hard bop lover’s dream come to life, and I have no doubt that it will make a fantastic addition to your personal playlist for a Saturday, or any other night! You can learn more about Jason Bodlovich and his music by visiting his web site. Something new: The allaboutjazz.com Jazz Calendar will now appear here each week! The calendar will list 20 upcoming jazz events within a 50 mile radius of Portland, Oregon. This calendar is maintained by allaboutjazz.com. If you have an event you want listed here, please go to this page on allaboutjazz.com. You may submit your event there.